Shortly after starting the Just Hands Across America tour Jack and I decided to take a hiatus from the podcast breakdowns to focus on putting in as much volume as possible across the country. Now that Jack and I are both back into a more regular routine, him in NYC and myself in Amman, Jordan, we're happy to announce the return of the weekly podcast breakdown! It feels good to be back. The hand discussed on this week's podcast was from a 5/10 session I played a couple months back at the Horseshoe Hammond right outside of Chicago. For those of you that heard the podcast, you'll remember how good the action was. This was one of the softest games I've ever played in, a lot of which had to do with it being a must move, so I got to play somewhat short handed with a great lineup most of the time. On top of it being a great game, I was also running pretty damn hot and this hand is no exception. Folds to Hero ($4000) with AA in the SB. Hero raises to $60. Folds to straddle who calls. Straddle covers. Hero bets 1150, villain tank folds. While there isn't much to discuss preflop, it's worth noting why I picked the sizing I did. From an exploitative point of view, when I'm 400 BB or 200 straddles deep with the biggest spot at the table, especially when I perceive that he's looking to win a big pot against me given our dynamic, I want him to rarely fold any hands preflop when I have the nuts. Given this is a player that liked to fairly liberally defend his straddles and big blinds, there's an argument for sizing bigger and getting more value preflop. In the moment, I thought that for just another $40 he literally wouldn't have a folding range where for 70 or 80 I think he maybe folds 15-30% of his hands respectively. If this assumption is correct, there's a ton of value of having such a strong hand against a player with a high propensity to bluff and make light call downs. For what it's worth, if I had a hand like T9s, I would make it 70-80 here and I would do so with most of my range. Here's where things got interesting. So I flop the nuts on a somewhat draw heavy board, but given the A and the K it clearly connects more with my range and on some level the other player was aware of this. So without any more information, it's close against this player between betting and checking. But when the flop hit I observed that he seemed very interested in the board. Given it's hard for him to have a very good hand, I felt checking to check raise would be better than betting as he has very few hands he wants to raise me on the flop with. After checking the villain obliges and bets 80, and I make a little under a pot sized checkraise to 250. I chose this sizing for a similar reason to my preflop sizing, basically that besides his pure air, which I don't think he has here due to the physical read, I don't want him to ever fold. I think with his two pair+ hands he's inclined to 3bet the flop anyways, and maybe his worst draws would fold to 300-350. With position and his stack, I would highly doubt he would have folded a gutshot for just an additional 170. Now the villain surprises me here and makes it 450. While it's hard to be sure, I don't feel like this is a sizing he would often use with a draw or with a top of the range value hand. I perceived this as a '3bet to see where I'm at' type bet with a good ace or king most of the time, with the occasional draws and two pairs in that range. I don't think villain is going to be doing much calling or shoving if I make it 1100 over the bet, and at the time thought he would continue with a lot of that 3betting range on the turn. Even if he's a bit more draw heavy than I felt he would be in the moment, I think calling is clearly best as we give villain the chance to bluff later streets and unless a heart comes and the three flush completes, we should have no problem getting a ton of value from his better value hands. On the podcast though, Jack offered something I didn't think of in the moment: shipping it. We have another 3500 behind and at this stack depth it's really great to get max value from his two pair+ hands and maybe the occasional AJ and AQ. Even without calls from the one pair hands if I think he's calling with all of his two pair combos due to their absolute strength, it becomes a very clear ship on the flop. If we were just 2000 deep or so I would prefer to try and get more value from his bluffs but when we're against such a crazy opponent where we can get it in with near 100% equity for an additional 350 BB, it's a pretty big mistake to not take it. 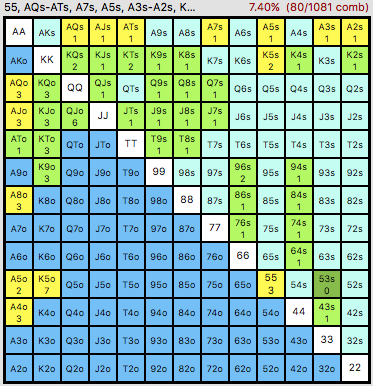 For value hands, I gave the villain all two pair combos, half the combos of AT+ (he 3bets these probably about half the time), 1/4 of the combos of other aces, and 1/3 of the combos of KQ-K9 (not including pair + draws here). For draws, I gave him 2/3 of his combo draws, half of his pair plus draws, 1/6 of his gutshots, and 1/3 of his Q, J, and T hi flush draws, and 1/6 of worse flush draws. It's pretty hard to estimate what his frequencies are here with my limited sample and this being such a unique spot. There are only a single digit amount of times in a cash game where I've check raised a wet board and been min 3 bet in position. In summary, on the flop the villain has approximately 15 combos of 2 pair+, 36 combos of one pair hands without draws, 5 pair + draws, 2 combo draws, 6 gutshots, and 14 pure flush draws. This comes to a total of about 50 value hands to 25 draws or a 2:1 ratio. Here's where I feel like I made a mistake. While I thought villain would bet the vast majority of the time, based on the composition of his 3betting range on the flop, many hands even for this player make a lot of sense as a check. With all of his draws, he may look at such brick and decide to give up. With the many one pair hands that decided to 3bet to see where they're at and to just win the pot on the flop without much thought to if 3betting makes sense, he may realize that while I have draws in my range, he doesn't want to risk getting check raised. Due to this, I think betting 350-500 in retrospect is definitely the clear play to get value from his middling value hands, draws that would otherwise check, and to be able to get stacks in against his two pair + hands that rerase as this player is never folding turn after raising me there. The downside of this bet is that I miss getting a checkraise in against good aces and draws. In the moment, I thought he would bet those hands the vast majority of the time. With some time now away from the table, I feel much less confident in that assumption which leans this street towards a bet. Once we get to the river, in the moment I thought the hand plays itself. Against a range that I think primarily consists of bluffcatchers and some missed draws, it's best to go for max value from the bluffcatchers given our dynamic. While villain has overbet bluffed me before, I think in this big of a pot even if he had 50% missed draws and 50% middling value hands, I would get much more value from overbetting than hoping he bluffed large. Now having thought more about his range, it's clear betting versus checking was the best play as even if he had double the amount of potential bluffing combos I want to bet to get value from his bluffcatchers. If this player didn't make many thin calls throughout the session and we didn't have this dynamic where it was clear he wanted to play pots with me, I would be open to betting a sizing around 2/3 pot. For everyone including myself, it's hard to think as clearly and rationally in big pots, as well as in spots one doesn't find themselves in often. This hand clearly fits both of those descriptions. While I feel like overall I played it well, I believe if I should have come to the conclusion I did away from the table about his turn betting range and lead out myself. Same goes for the lack of a flop overbet ship. It's not a hand I'm beating myself up over though - I took my time and it's hard to play 100% as well as one can think without the pressure of making a decision for thousands of dollars. I'm happy I had the chance to both bring it on the podcast and do the breakdown to ensure that in future spots like this I stay in the zone and bring this same level of care to my decision making process. Do you live on the east coast and want the Just Hands take on your game? Sign up for our live leakfinder in the NYC area! If you liked the content you just read and want to help us continue to grow our poker strategy blog, please consider supporting us by simply clicking or bookmarking this link before making a purchase on Amazon. It doesn't cost you anything and we would sincerely appreciate it!